Workplace Wise - BrownWinick Employment Law Blog: Welcome to Our Blog! 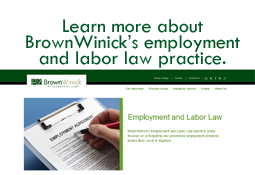 Welcome to the BrownWinick Employment & Labor Law Practice Group blog! We look forward to using this forum to discuss the latest news, trends, cases, and legislative updates.